Description: Round aqua lamp shape with a tiny round knob on the top and 6 unsidedown heart outlines on the sides. The side edges are scalloped. The inside of the lampshade has a raised hollow peg that the peg on top of the lamp stand fits into. Measures 11/16" diameter, 3/8" high. Description: Aqua lamp stand with a round 2 tier base and an upright post that fits into the hole on bottom of the FPT17063 lamp shape. The lampstand resembles a candlestick. Measures 13/16" tall, 3/8" diameter base. Description: Small round light blue lamp shade with scalloped edges along the bottom, and lines on the sides. The shade has a hole in the top that fits into a peg on the FPT6966 lamp stand's neck. Measures 3/4" diameter, 1/2" tall. Description: Small round dome-shaped clear plastic light bulb cover that fits on top of the FPT6619 chapel roof. Two sides have pegs that help the cover stay attached to the roof piece. Measures 3/4" diameter (1" wide including side pegs), 15/16" high. Description: Round clear plastic 3-tier chandelier that covers the FPT16861 light bulb inside of lighted Precious Places® buildings. The bottom tier is textures to remove the chandelier. Two sides of the top (largest) tier have pegs that help the chandelier stay attached to a battery-powered Precious Places® roof piece. Measures 1-1/16" diameter (1-7/16" wide including side pegs), 7/8" high. Description: Clear plastic wall sconce with a half-shell light cover and a dome-shaped cover under the light bulb. The shell light cover has a scalloped edge across the bottom and tiny raised molded heart designs on top of each scallop. The top back side has a square clear plastic plug that plugs into the FPT17130 electrical center wall (inside the mansion). Measures 1-5/16" wide, 13/16" tall, 7/8" deep. Description: Small round 3V light bulb that attaches to the roof section of lighted Precious Places® buildings. See Replacement Bulb TOT114. Description: Tiny light bulb that fits into Precious Places® lamps. Measures 9/16" long, 3/16" diameter bulb. See Replacement Bulb TOT115. Description: Round pink lamp shape with a tiny round knob on the top and 6 unsidedown heart outlines on the sides. The side edges are scalloped. The inside of the lampshade has a raised hollow peg that the peg on top of the lamp stand fits into. Measures 11/16" diameter, 3/8" high. Description: Pink lamp stand with a round 2 tier base and an upright post that fits into the hole on bottom of the FPT17113 lamp shade. The lampstand resembles a candlestick. Measures 13/16" tall, 3/8" diameter base. Description: Tiny dark pink heart-shaped lamp with a round base on the bottom and a round lamp shape on top. The lamp shade has a bow imprint on 2 sides. Measures 3/4" tall, 3/8" diameter. Description: Tall white lamp stand with a round base, and a curved neck at the top that holds the FPT6967 lamp shade. The pole has ribbed sides. Measures 2-1/4" tall, 7/8" wide, 13/16" diameter base. Description: White ceiling light with a long pole that has a squared plug on the end. The end of the pole (beside the plug) has a round decorative cover that is flat across the top to be flush with the ceiling. The light has a clear plastic dome-shaped shade that is scalloped across the bottom edge, textured on the sides, and has a round clear plastic cover across the bottom. The lamp plugs into the FPT17130 electrical center wall (inside the mansion). Measures 1-1/4" wide, 1-1/4" tall, 2" deep. Uses tiny light bulb FPT45440. Description: Round white ceiling light with a round base and a round piece on the side that has a square plug on the end that plus into the FPT17130 electrical center wall (inside the mansion). 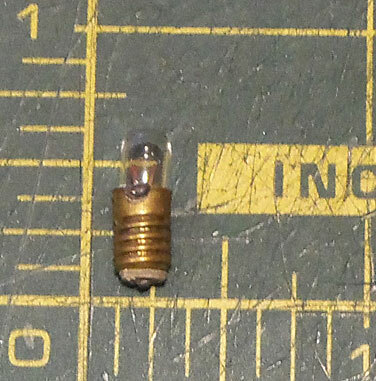 The light has a rounded clear plastic light cover on top that cover the bulb inside. The top of the light cover is scalloped and has a round clear plastic cover on top. Measures 3/4" wide, 1-1/4" tall, 1-3/8" deep. Uses tiny light bulb FPT45440. Description: Round white lamp with a flat bottom and a short white pole on the side. The pole has a rounded cover that is flat on the bottom and has a white plug on the end that plugs into the FPT17130 electrical center wall (inside the mansion). The lamp has a round clear plastic lamp shade that covers the bulb inside. Measures 3/4" wide, 1-1/4" tall, 1-1/4" deep. Uses tiny light bulb FPT45440. Description: Square white porch light with a square clear plastic light cover on top that covers the bulb inside. The back of the light has a square peg that plugs into the edge of the FPT17130 electrical center wall (outside of the mansion). Measures 3/4" wide, 1-5/16" tall, 15/16" deep. Uses tiny light bulb FPT45440. Description: Tiny yellow heart-shaped lamp with a round base on the bottom and a round lamp shape on top. The lamp shade has a bow imprint on 2 sides. Measures 3/4" tall, 3/8" diameter.